Join the discussion on our forums! 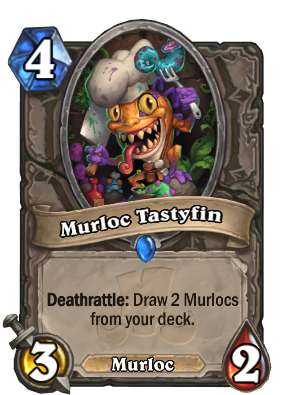 Come discuss Murloc Tastyfin over in our dedicated Murloc Tastyfin discussion topic. Deathrattle: Draw 2 Murlocs from your deck. Scargil can make this card viable. 9 out of 10 Hungry Crabs agree – this murloc is extremely tasty. Would have been very good if it was a battlecry, but as a deathrattle it's not good in my opinion. I want to try this out in my wild murloc shaman. It's got decent stats and works as an insurance against AOE. Not half bad. Probably not enough to make murlocs great again, at least not on its own. So Pirates got draw mechanics now Murlocs got neutral draw mechanic too. It's going to be really weird world next rotation.